Pink and green is a super classic combination (I could tell you about it via the tile floor in my childhood home…but I’ll save that for when I find photographs one of these days) but it’s often depicted as a extremely pop-ish or overly sweet. Not that there’s anything wrong with that approach, which is beloved by teenagers all over the world, but I want to point out that it can definitely be done in a way that is both a little more refined, a lot more subtle, and quite a bit less girly. 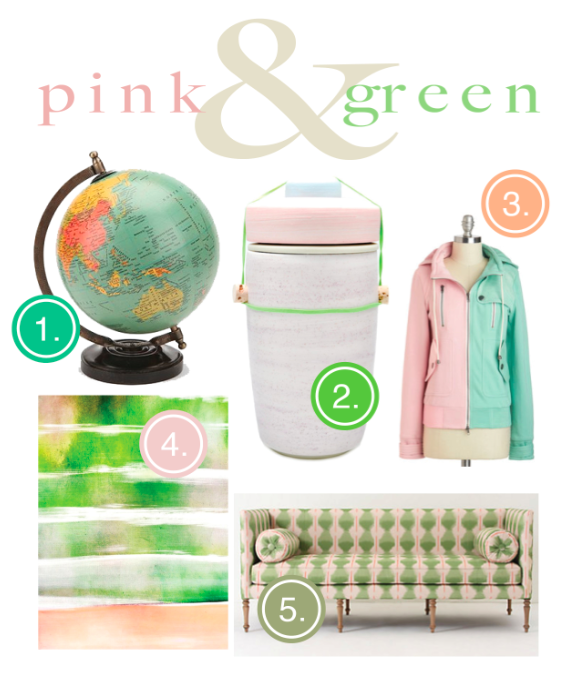 Here are five pink and green items that caught my eye because they take a typical combo and update it a bit. I especially love the globe! Enjoy the round-up! ← A Slide in the House!